Proper acid adjustments rely on accurate measurements. This advanced set-up for total acidity testing will have you running acid tests fast and accurately. Comes ready-to-use, complete with our own set of directions. 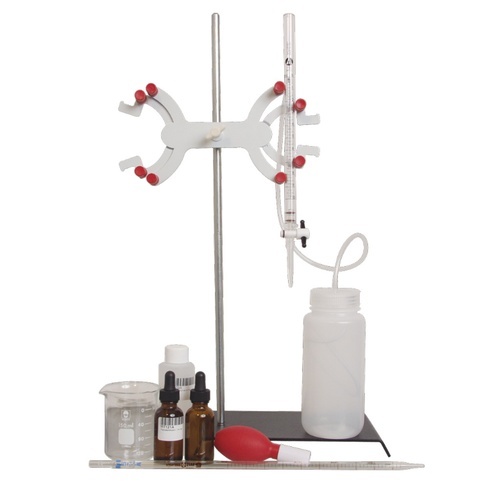 Equipment set includes support stand with metal base, double buret holder, self-zeroing buret made from break-proof polycarbonate, a 150mL beaker, and a 5ml pipet and bulb for measuring your test sample. Also comes included with a 4oz bottle of 0.1 normal sodium hydroxide and a vial of phenolphthalein. Most customers who buy this set also pick up a stir plate (Y700) to faciliate constant mixing of the sample being tested. Click here for the MoreWine! Guide to Advanced Acid Testing.